Terafox is a software company and publishing house, which develops and offers products and services for digital training and marketing, taking advantage of the gaming experience solutions, Internet and multimedia. Terafox on ohjelmisto- ja julkaisuyhtiö, joka kehittää tuotteita ja palveluja digitaalista koulutusta ja markkinointia varten, hyödyntäen pelillisiä ratkaisuja, internetiä ja multimediaa. A Viking history learning game project and travel advertising portal for municipalities and enterprises. In the Footsteps of the Vikings in Facebook: facebook.com/fovigame - We hope you'll like it. Our main focus is in learning games, especially for companies, for example, for staff induction. Gameplay maintains learning via interest and makes it easier. Measuring one's skills through the game is easy. Why not even as part of the recruitment! In the company's website, as the first step in recruiting. Works at the same time as advertisement of the company. Business games are suitable for training of personnel, for entrepreneurs starting a business, school children to learn about the business world. And they are great for creating that internal entrepreneurship. Emphasis might be in production, economy, marketing, ... Durations can vary, but learning in a long-term play, a little at a time on a daily basis, is most effective. Business games can be drawn up from the business model of the enterprise, domains can be practiced just the way that your company is and wants - and which are able to create the greatest attention. We create advergames for companies, at corporate home pages. Making a product familiar to the consumer and consumer to the company! It is, after all always about a learning game: the consumer learns about the firm and its products, before buying. And the company has the opportunity to learn something about the consumer, as well as to obtain contact information of interested consumers. We prefer in these long-term, engaging game models. We have also developed concepts for municipalities and cities suitable for tourism marketing. Cities can also promote themselves through a game, like in "In the Footsteps of the Vikings" concept. In this case, the solution will be cost-effective, and in addition the visitors and potential visitors - virtual tourists - will naturally come to the portal and the city's website. It is possible to implement in a travel portal a game or two. We provide games, multimedia presentations and portals, always based on the most suitable techniques, as web pages, web applications, or applications as well as mobile web pages or applications. And other marketing and promotional tools in combination, in accordance with these corresponding the media mix. Terafox was founded in 1991, as electronic information company and software company. The commercial Internet was not known, but there was seen the development of telecommunications, and information to be electronically transmitted, digitally. It was also evident that the computer will continue to develop and may be also increasingly used in training. These things in mind, we set up the company. First project was a musical telephone service. However, this was not successful, and one reason why was that the recession had begun. Since then, we moved to take advantage of our expertise in different areas of information technology, training, consulting, support services and software and hardware store. We continued the development of telecommunications, the first project in the form of bulletin board system services (BBS IU) in collaboration with the local school Edupoli. Co-operation was continued by starting Avenet - a regional network in the Internet, in 1994. Our strategy is characterized by the fact that we consider the selection of the target group of the utmost importance in order to get the commitment of the core interest groups, be it at any site. This is particularly important in learning game. Often, the tip of the core group when committing themselves will pull other users, and with their help it can have a long-lasting effect. We believe that technological and graphical refinements should serve the actual matter; learning and business goals, whether in training or advertising. Gimmickry can make impact to other nerds or artists, but we and a real customer appreciate the content and experience. Too fine and clever technology, or rich and polished graphics is likely to alienate and even expel users, although it’s sometimes successful, of course, and could also be the main attraction and talking point. The most important thing is that the technology works smoothly, reliably and quickly, and the user interface is clear and understandable. We want our potential user base to be as broad as possible. We strive in everything we do to gain the international markets. That is why our work is continuous learning, understanding language and cultural differences. 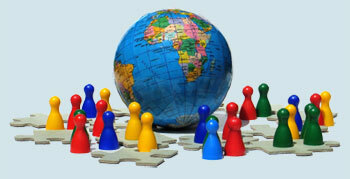 In this way, we want to help also our customers in the internationalization. Terafox Ltd has five shareholders. Everyone has a strong background in computer science, programming, and graphics. We have even musical skills! We have extensive experience in education, specifically in information technology training, but it has given us a perspective on learning in general, and the training needs. In addition, we have a long experience, good contacts with a wide network of professionals in various fields of information technology, art, graphics, music, education and communication. Terafox proficiencies, International co-operation: Norway, Iceland, Germany, New-Zealand. Tourism marketing, strategy, planning, development. EU-financed project plans: Innopoint, FinEst, Open Distant English Learning, Digital Biovillage. Development of Avenet Regional ISP. Software development for Management Institute Business Games. Multimedia laboratory, network, programming and database education. Computer Driver`s License education and development. IT administration and support. Books about Linux in business and IT in customer`s service.